Almost a month back we reported of Yahoo! undergoing a reconstruction phase to roll out a new version which would deliver a brand new outlook to the Yahoo Mail Interface. The new look is currently in beta form and made available for everyone. Yahoo! 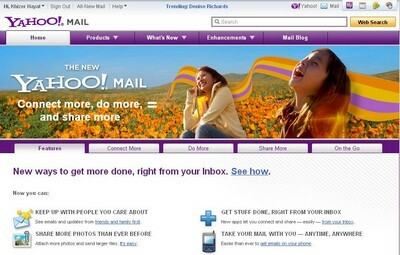 stepped up efforts to improve and bring life back to Yahoo Mail, promising a speedier interface with a number of new features including social networking integration and a Gmail type feature called the ”Priority Inbox”. I’m pleased to announce the release of Yahoo! Mail Beta, which delivers a faster, safer and more social email experience. The new Yahoo Mail beta version delivers a brand new outlook, a smartly designed interface which is inspired from the Yahoo Mail App for iPad and the smartphones. Yahoo kept its purple theme maintained, with the main page showing various tabs for the user to tap in. Yahoo! Mail Beta promises a faster mail experience. The new mailbox is more than two-times faster compared to the previous versions of Yahoo! Mail. Every mail server’s nightmare is Spam. Yahoo! Mail beta makes your inbox a much safer place as it promises to block more than 130 Billion spam messages every month. Yahoo is surely known to be a winner in battling spam compared to other mail servers. Yahoo has now gone social. 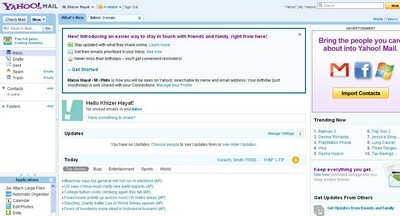 The company invited Twitter, to join in the fun and lead the redesigned Yahoo! Mail. From now on you can directly tweet your friends, retweet or compose a new message alongside Facebook posts and Yahoo! status updates. Yahoo also updated the IM and SMS features, making it more productive. You can now organize your conversations in separate tabs, switch between text and chat conversations as well as dock the conversation while multi-tasking. With the new Yahoo! Mail Beta version, you can also browse rich slideshows from Flickr or Picasa links and watch video clips from Flickr and YouTube right from your email.